Get the checklist you need to use Twitter effectively for business. By building up your followers on Twitter, you gain natural authority. Authority naturally attracts leads, sales and other business opportunities to you. It opens doors. An influencer who works with, mentions or otherwise supports your business can lead to rapid growth of your business, along with a range of other benefits. But it doesn’t have to be anything so involved. It may simply mean they share your content and help it attract a much wider audience. Twitter provides an easy platform on which to connect with such influencers and begin a relationship that could prove immensely profitable. 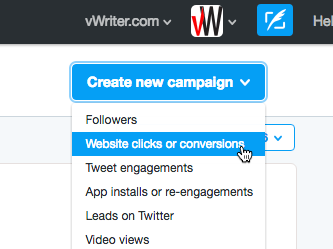 Add something like via @[their Twitter handle] to help attract their attention on their Twitter Notifications tab. However, a single share or retweet is unlikely to do very much. If they’re an influencer, dozens or even hundreds of others may be doing likewise, depending on your industry. But by doing so consistently, and combining it with additional communications (e.g. leaving comments on their blog) and shares on other social platforms can help you rise above everyone else and put you firmly on their radar. They may then be more amenable to, for example, sharing your content at some point in future, and further developing a relationship with them. Start a conversation with them by regularly replying to their Tweets that share some recent content. Let them know what you liked. Be sincere. Retweet it to your own audience. 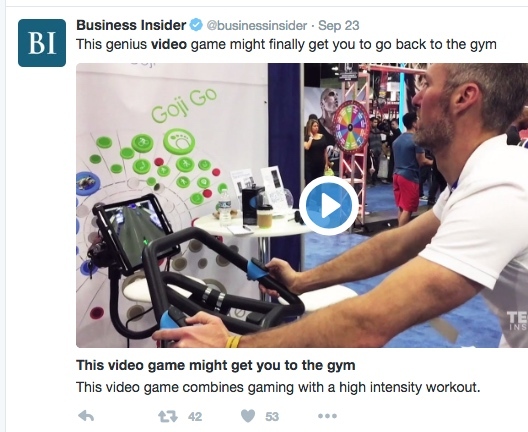 Even when not sharing their content directly, try mentioning them in other Tweets. For example, if you have included a quote from them in your own content, add their Twitter handle into the Tweet when you share it. Or share a Tweet sharing one of their quotes. Or send a Tweet with a question that invites them to join a conversation. They might just take the bait. Check if the person you want to connect with runs (or participates in) regular Twitter chats, and participate as often as possible. By sharing content of interest to your market, you will naturally attract people in your market to you. Follow you: I currently attract hundreds of Twitter followers a month by doing just this. Once following you, you’ll be more visible for them, and you’ll build their awareness of your business. You also increase the potential they will share your content with others. They even become a direct lead for your business. Like the content: if so, follow them as soon as possible so your Twitter profile is fresh in their minds. This increases the likelihood they’ll follow you back, and shows you’re active on Twitter rather than just running a robotic account. Share your content: this amplifies your content (see #16) by attracting their audience to you. Click-through on your content: presuming it’s your own rather than curated content, this can translate directly into leads for your list, or otherwise entering your sales funnel. Twitter gives you a number of ways to better understand your market. Doing so can lead to better products and services, or even brand new ones, and therefore higher profitability. Use Twitter Analytics for insights on who is following you, and the content that has attracted the most engagement. 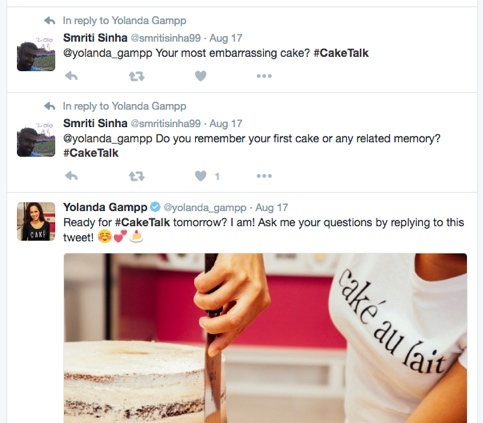 For example, clicking Top Tweets from the Tweets tab shows which Tweets have attracted the most engagement. This can help guide future content creation. 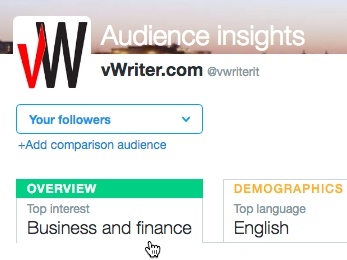 Alternatively, click the Audiences tab for demographics and other information regarding your followers. For example, see information about their interests, occupation, gender, net worth, age, country and more. For vWriter’s Twitter account the information shows, amongst other data, an even gender split, that the vast majority are between 25 and 44 and relatively affluent. It also shows they have a penchant for salty snacks! What are They Engaging With? Use Twitter to see what people in your market (regardless of whether they follow you) are talking about, what they engage with, and the type of content they are sharing. This gives you some unique insights into understanding their needs, frustrations and desires, guiding future content and product development. Are people using Twitter to discuss something of interest and relevance to your market? Join in, and build up your visibility while contributing opinions and expertise. Or simply reply to a Tweet that resonated with you or that is relevant for your business. Don’t sell your wares, just join the conversation. Or start your own relevant conversation. Ask a question and engage with those who respond. Reach out to people individually through Twitter. This doesn’t mean sending out hundreds of DMs telling followers to visit your site, join your list or make a purchase. It does mean interacting and communicating with them to understand their needs better as in #4 above. Invite them to share or provide feedback on your content. Invite them to connect with you across other social channels, thereby deepening the relationship. Offer help and value. Give value first. When people help you by sharing your content, thank them directly. Keeping up with the latest content for your industry, means you can “be” the expert. Your growing expertise translates into more knowledgeable and insightful communications with prospects, including in the content you produce, and you naturally grow your authority. Source relevant content of interest to your market and share it over Twitter. Share relevant Tweets from others in your industry. As well as helping attract your marketplace to you, it helps you network and build valuable business connections. Twitter’s data makes it a goldmine for advertisers. When approached correctly, it represents one of the most profitable uses of Twitter for business purposes. 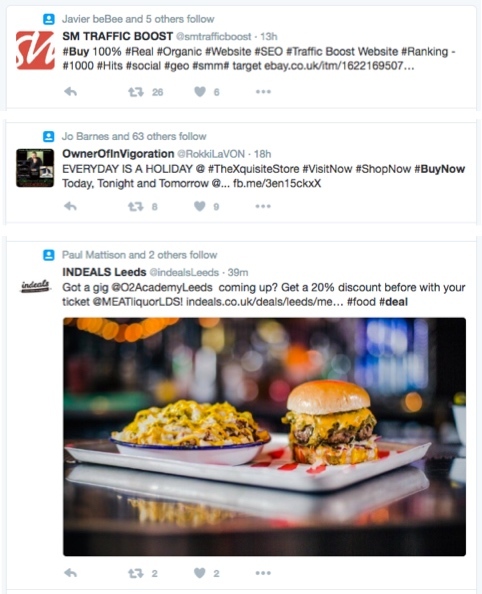 I wrote about using Twitter advertising in more depth in this post. Of course, by sharing your content regularly over Twitter and building your followers, you’ll develop an organic traffic tap you can turn on and off at will. Many businesses continue to be dangerously dependent on search traffic. Twitter provides diversification, with an additional powerful organic traffic channel that’s easier to both control and exploit. As with search, however, it takes time for the traffic benefits to build and for the benefits to show. But the rewards make it well worth the investment. And as this list shows, there’s a lot more to gain besides traffic. 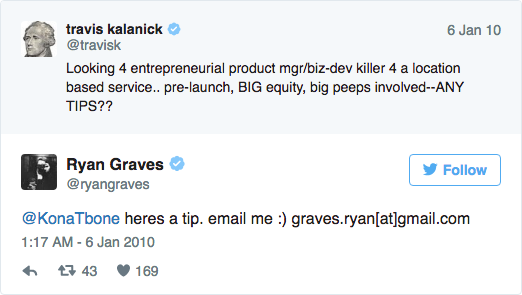 Countless profitable relationships have started thanks to Twitter. It’s a powerful channel through which you can network and find potential collaborators, business partners and others you can work with in the course of growing your business, often for mutual benefit. Drive traffic back to content on your site (see #11), which you then convert into leads. Similarly, send traffic direct to opt-in squeeze pages. For example, offer a relevant lead magnet. Message people directly with information about a suitable lead magnet they may be interested in. Or take the more subtle approach: ask for their feedback about some content, into which you have integrated mechanisms to convert the traffic into leads. This can be on your blog, but might just as easily be say a SlideShare presentation, a video, or article on Medium. The more content you share over Twitter, the more visible your business – your brand – will be for both your followers and others. Effective marketing is often about regular, continuous communications, building up familiarity with your brand and a sense of relationship with you as a business. Twitter content also shows up on Google in some circumstances. 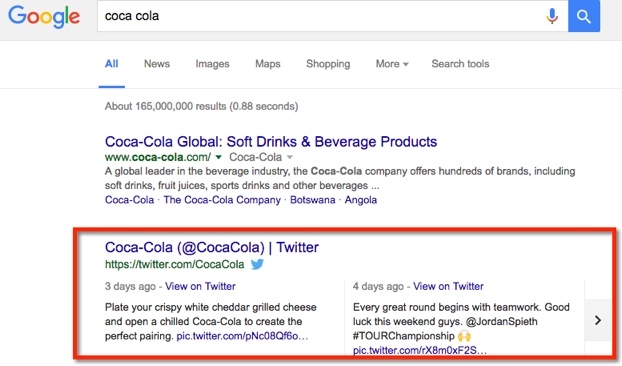 Tweet relevant content regularly, and you increase the chances your own content will feature in the SERPs. But it’s not just about your content on the Twitter platform itself appearing in search. Perhaps more importantly, it’s also about how your usage of Twitter can help your other content to build search visibility too. There’s a direct correlation between social activity and search rankings. In fact, it’s hard to separate the two. It’s virtually impossible to employ a successful organic search optimization effort without robust social content or social presence. These social signals have eclipsed signals like links. I talk more about how this works in the Content Authority Formula (make sure you have your copy). Want to increase the reach of your content? Twitter helps you do just that. Sure, you can share your content with your own followers. But a proportion of those (and others) will then retweet that content with their audience, helping to amplify your content with new (and often highly relevant) networks you wouldn’t otherwise reach. Unsure about the headline or title that might work best for your content? Share the content multiple times (as you always should), tweeting a different potential title each time. If you find a particular version attracted far more engagement levels than another, consider updating the title on the original content. It’s not just about testing individual headlines though. It’s about improving your feel of what works best for your marketplace. This continual positive feedback helps improve the content you create over time, and increases your results. See the type of content others are creating for your industry that attracts a lot of engagement from your market. Could you create something similar? Content you come across on Twitter can not just inspire your own content, but can inspire new ways of thinking about the way you run your business, new marketing approaches, new lifestyle choices, new ways of using social media for your business, and more. Of course, Twitter is not just for textual content and static images. It’s also for videos, which can be highly engaging, attract higher levels of response than other content, and build deeper relationships with your audience. The best way to use Twitter and other social media channels is rarely to go for the sale immediately, but to attract leads onto your list (see #13). From here, you can build the relationship (and path to the sale, and a long-term customer) over time. For example, you might test a Twitter-only promotion that offers a discount or perhaps an additional bonus for a short period. The Tweet can always be deleted afterwards if you don’t want the offer to show for long. You can also be more creative, and test tweeting quality, shareable content that actually acts as a long-form sales piece for a particular product, including a call to action at the end. Or perhaps content that attracts visitors into a short-period sales funnel with some kind of limited offer. It all depends on, and is worth testing for, your own market. If you’ve ever wondered how to put Twitter to use properly for your business, that’s 20 different benefits you can start accessing or working towards immediately. Don’t forget to get the checklist you need to use Twitter effectively for business. Excellent in depth article, covering all the important aspects of Twitter. Useful for newbies and seasoned Tweeters alike. Thanks Steve.